A serpentine cross sculpture (the Brazen Serpent Monument) atop Mount Nebo was created by Italian artist Giovanni Fantoni. It is symbolic of the bronze serpent created by Moses in the wilderness. 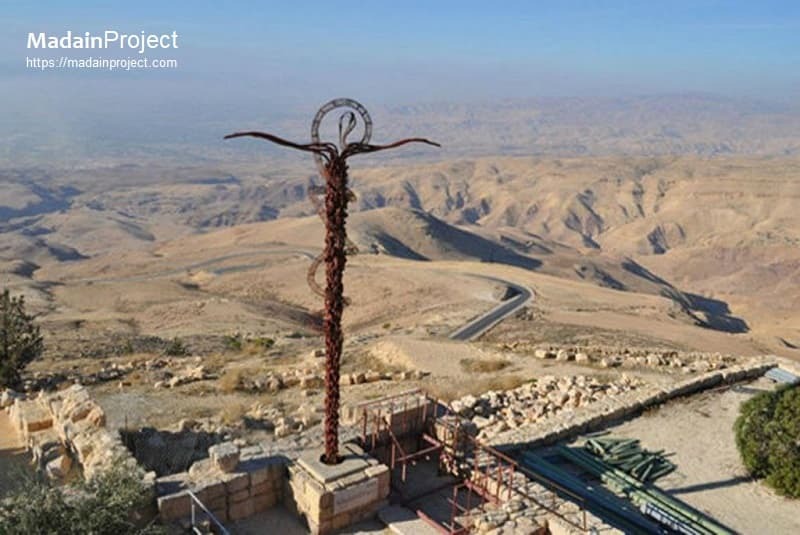 The sculpture of a Brazen Serpent of Moses Memorial Church, Nehushtan, is the sarpentine cross that stands on the terrace of Mount Nebo was created by the Italian artist Fian Paolo Fantoni. It recalls the bronze serpent on a pole which god told Moses to erect to protect his people from the poisonous snakes that god himself had sent as punishment. It was enough to look at the bronze serpent erected by prophet Moses in order to be healed and saved. Jesus applied it as a foreshadowing event to his own execution on a cross stating, "And as Moses lifted up the serpent in the wilderness, even so must the Son of man be lifted up: That whosoever believeth in him should not perish, but have eternal life. For God so loved the world, that he gave his only begotten Son, that whosoever believeth in him should not perish, but have everlasting life" (John 3:14-16).